Jupiter's moon, Europa, is thought to hide an ocean beneath an icy layer. This liquid ocean bears striking similarities to lakes buried beneath the Antarctic ice. Russian scientists in Antarctica have reached a lake that's been buried in ice for more than 14 million years — a milestone that could provide hints of what to expect when the ocean under the icy crust of Jupiter's moon, Europa, is similarly explored. After more than a decade of drilling, the team broke through the ice on Feb. 5, reaching a hidden cache of water known as Lake Vostok that has been cut off from the surface since an ice sheet covered it between 14 million and 34 million years ago. The isolated lake bears similarities to features on Europa, whose icy surface is thought to hide a liquid ocean layer. "When it comes to Europa, there's no better analog on Earth than Lake Vostok," Kevin Hand, deputy chief scientist of solar system exploration for NASA's Jet Propulsion Laboratory, told SPACE.com. "In both cases, the liquid water envelope trapped beneath the ice is cut off from the sun," he said. 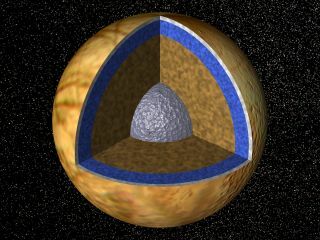 The depth of the lake isn't the only parallel to the Jovian moon. Samples of ice from the top of the lake revealed that iron and sulfur play a significant role in its ecosystem. "The surface chemistry of Europa is riddled with sulfur," Hand said. "Chances are that sulfur is going to be an important component for how that ecosystem survives." If the Russian team finds life beneath the ice in Vostok, the discovery could provide insight into what sort of life could develop on Europa. The icy moon boasts two to three times the amount of water found on Earth, water that has most likely been liquid since the birth of the solar system. Because water on Earth played a vital role in the evolution of life, scientists hope that its presence on other planets and moons could have a similar effect. "Europa is the premier place to search for the second origin of life in the solar system," Hand said. "If we do find a living ecosystem in Lake Vostok, [then] learning about what makes that ecosystem tick, what allows that life to arise and thrive, could provide guidance for how to look for and understand the potentially habitable environment of Europa." This color composite view combines violet, green, and infrared images of Jupiter's intriguing moon, Europa, for a view of the moon in natural color (left) and in enhanced color designed to bring out subtle color differences in the surface (right). The images in this global view were taken in June 1997. When Russian teams began drilling in Antarctica for ice cores in the 1970s, they had no clue that their site lay above Earth's largest subsurface lakes. Attempts to reach the lake began soon after, but faced a number of challenges, including equipment failure and a desire to avoid contaminating the samples that might be retrieved. Even now, the team won't be able to investigate their findings for another year. The drill they used only retrieves ice samples. When they broke through, water poured into the hole they bored. The Russians will extract it after it freezes, in late 2012. And the challenges the Russian team has faced in Antarctica will only be magnified if scientists can mount a mission to Europa. "Imagine the challenge of drilling on a small, frozen, distant world orbiting Jupiter," Hand said. "We'd need to get it done robotically, without humans along to bang a hammer into the machine to get it working." Though difficult, Hand doesn't think such exploration is impossible. "The biggest challenge to exploring the solar system is money ," he said. "The technology is waiting in labs all around the country, but there is no political or financial means to get it done." And the persistence of the scientists in Antarctic provides hope for the future. "They are showing us that the Russians have the will and the way to get bold exploration done," he said. "Hopefully, we in the U.S. can do the same."